Standing 80cms to the shoulder (male) and 70cms (female) and weighing in at around 40kg (male) and 27 kg (female) the Bushbuck is the smallest member of the spiral horned antelope. 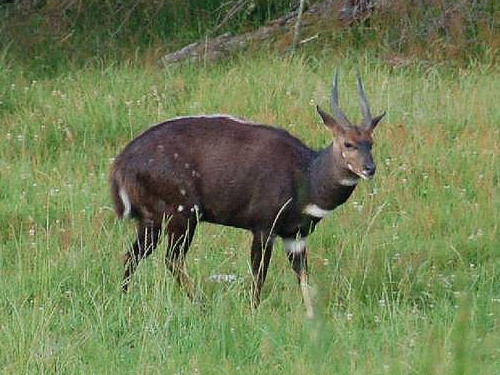 A little bigger than the European Roe Deer, the Bushbuck has a dark reddish brown coat with white spots on the rump, at the base of the neck and a white “gorgette patch” below the throat. Bushbucks provide a challenging hunt, as they are shy and elusive. Generally a non gregarious species, Bushbuck prefer riverine bottoms and dense thicket, near a water source as Bushbuck require to drink daily. Generally a crepuscular species and a browser, Bushbuck feed early mornings and late afternoons on leaves, grasses, buds, flowers and fruits. Only the male Bushbuck have horns and mature Bushbuck males are considerably larger and darker in colour than the female. His alarm signal when disturbed is a hoarse dog like bark, very similar to the European Roe Deer. Rifle calibres used to hunt Bushbuck should be 7mm or .30 using suitable, quality bullets. Shot placement on Bushbuck is paramount as a wounded Bushbuck presents a dangerous follow up. A Bushbuck wounded or cornered is very aggressive and will charge. Extreme care is required following up a wounded Bushbuck. Every year hunting dogs are wounded and killed by badly shot bushbuck.